Jack Moes, in his role as an authorised crop sampler, likely saw the most hemp fields of any person in North America this year. All in all, he inspected close 100 fields in Saskatchewan and Manitoba, including commercial fields and pedigreed seed fields and plots. Hemp does not like "wet feet"
In 1998, faced with the prospect of having to multiply a small lot of FIN-314 planting seed to supply a growing market, we (at Gen-X) were looking for various ways to increase crop yields. We identified irrigation as a possible solution. To test our hypothesis, a crop of FIN-314 oilseed hemp was planted under a pivot irrigation system in 1999. This crop ended up yielding just over 2000 lbs./acre of uncleaned seed (previously reported in the HCFR), possibly a record for commercial production in Canada. This gratifying result led us to explore the benefits of irrigation further in 2000, both in plot research and commercial production. The results are extremely encouraging. In co-operation with the Sask. Hemp Association and the Canada-Saskatchewan Irrigation and Diversification center, in Outlook, a replicated plot trial was planted in late May, 2000, to compare the response to irrigation of eight common varieties of hemp. All varieties grew extremely well, both in the irrigated and non-irrigated plots, due to good weather conditions, proper fertilisation and good seeding techniques. FIN-314 was the shortest and earliest variety, maturing at five feet (non-irrigated) to six feet (irrigated). Some of the taller varieties surpassed 12 ft, with a significant increase in height and biomass due to irrigation. Unfortunately, complete seed yield results could not be obtained, simply because it proved impossible to harvest any varieties except for FIN-314, the others being too late and too green, and too much for a plot combine to handle. However, the FIN-314 plots were harvested without too much difficulty. To sum up, non-irrigated FIN-314 yielded an average of 1398 kg/Ha of clean seed (1255 lbs./ac), and a maximum of 1671 kg/Ha (1501 lbs./ac). In the irrigated plots, FIN-314 yielded an average of 1742 kg/Ha (1565 lbs./ac), and a maximum of 2364 kg/Ha (2123 lbs./ac). This corresponds to an average increase in seed yields by 25% due to irrigation. In commercial production, three FIN-314 crops were planted under irrigation systems in 2000, for a total area of 185 acres. These crops were among the best crops harvested this year, all yielding above 1000 lbs./acre (the average yield for conventional FIN-314 growers on the prairies in 2000). David Wiens, of Lomond, southern Alberta (near Lethbridge), achieved yields of 46 bushels (uncleaned) to the acre on 40 acres (approximately 1600 lbs. of clean seed per acre). It is evident that irrigation can increase the competitiveness and vigour of hemp crops, especially in areas of the prairies where dry spells and scarce moisture are an issue. In all cases, irrigation was applied only on a need basis; only one or two passes (waterings) during drier periods may be needed in a season to significantly increase yields - timing is everything in cost-effective irrigation. Samples of "irrigated seed" were analysed for their essential fatty acid (EFA) profiles, with interesting results. The samples from irrigated fields were significantly higher in GLA content (3.8 - 4.3% GLA) than non-irrigated samples (3.2%). These are preliminary results, which may warrant further investigation, but it seems safe to hypothesise that irrigation may encourage better seed formation and maturity, thereby increasing GLA levels. Irrigation can thus be indirectly linked to higher GLA levels, higher yields in FIN-314 hemp, and possibly, higher total levels of polyunsaturated fatty acids. Sasha Przytyk sasha@gen-xresearch.com is the manager of Gen-X Research Inc., vendors of Fin 314 in North America. He is a frequent contributor to this journal. 1) In an age of genetic tic-tac-toe and high-powered crop breeding, what does the modern agricultural community want with homeless wild hemp plants? What makes feral hemp, ditchweed, so important all of a sudden to everyone watching cannabis these days? 2) DEA destruction of the Oglala Sioux project a few months ago was actually feral hemp cultivated on native land from wild seed collected the year before. 3) Much was at stake with this sassy action of defiance that asks the question -- who has the final word in Aboriginal affairs? Heavy odds for a cultural autonomy play that would determine the future of Native people everywhere. It was served notice by way of helicopter that until further notice US Federal law is supreme over Native American law, even on Native land. Feral Hemp was the prize and target both. Feral hemp would determine the tideline where native and Federal policy actually met. 4) For the time being, one man's farm is another man's felony. Feral hemp is a prize, a genetic treasure house of adaptive traits providing a starting point for crop scientists to breed 21st Century Hemp. The sheer tenacity for survival of wild hemp could offer a genetic edge for the crop if it could be coaxed to grow in the many climates of North America. 5) Compared to industrial hemp and marijuana, Feral hemp is very fast flowering, and wild seed tends to ripen earlier than cultivated varieties. The fewer number of days required to maturation, the farther north hemp could be grown. Response to daylength is critical for hemp to flower. Bargain seed from the south would not be expected to mature properly at 55 + degrees N. latitude. 6) Feral hemp's outstanding resistance to drought, winds, insects and disease has been tempered to perfection during decades or perhaps centuries in the field. This is God's hemp, naked and wild and free. Feral hemp adapts to new conditions and morphs readily to make best use of differences in daylength, growing season, nutrient and moisture availability. 7) If the hearty weed aspects of feral hemp are carefully examined and cultivated, they might assume profiles the industry is most interested in, such as low THC content and resistance to pests; and perhaps most important, richness of nutraceutical content of the edible oil. 8) Pot breeders who offer quick flowering high THC varieties have been known to start with feral hemp and breed in popular drug varieties over successive generations to produce fast flowering, sturdy little stoner bushes. 9) Under optimal conditions hemp's response to favourable conditions can be very dramatic -- seed crop trials in Saskatchewan this year surpassed last year's record harvest of over a ton of seed per acre... and that's just feeding and watering the plants properly. 10) Gene splicing hemp with unrelated species has been successfully done in the lab. A cannabis/aspen fusion tree clone was quietly introduced into Western Canada clear-cut zones a decade ago, a frankenforest that has the heart of hemp beating in it. 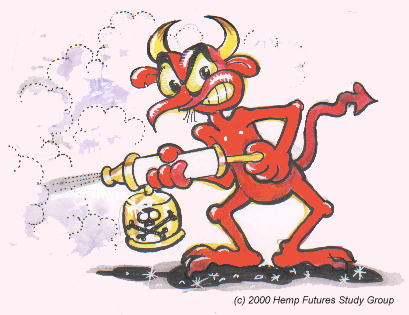 11) We read that the DEA routinely destroys thousands of acres of wild US hemp each year in the belief that it is marijuana. They know the difference between these two forms of cannabis better than anyone does. Why do helicopters spray wild hemp every year? It costs a fortune. Why is feral hemp such a bone of contention when nobody in modern times believes is a drug? Ditchweed is not an acceptable product on the black market and furthermore, feral hemp never appears in police seizures of marijuana. 12) Feral hemp is an unknown commodity -- and presents a Tylenol® moment for those charged with policing cannabis activity worldwide. Feral hemp in its early stages of growth resembles marijuana, the leaves are identical in size and the flowers are dead ringers for pot; but hemp smells different from pot and a cross section of the stalk shows a different vascular structure from pot that is discernible to the naked eye. 13) Feral hemp seeds are always smaller, darker and noticeably pointed, more so than either industrial hemp or marijuana. Feral hemp seed oil is often richer in GLA and EFA and protein than commercial hemp, although yields are much lower. 14) Feral hemp fibre is often coarser than cultivated hemp, but equally as strong. 16) Feral hemp is one of the last treasure gene pools out there in the agricultural wilderness. This is not mere aesthetics -- of the millions of plant species growing on earth, only a very few are have been brought under cultivation, fewer still are in regular production. Plant treasure hunters have not stumbled upon a significant new food or forage crop in many years. 17) Feral hemp is being closely investigated at the University of Mississippi, where feral strains collected from many parts of the continental USA are cultivated and tested for drug content, seed and fibre quality to be ready for the day that the US undertakes her own domestic cultivation program. 18) HRH Prince Charles recently blessed and bankrolled an ambitious Empire deep freeze depository for wild UK plant seeds - The Millennium Seed Bank-that hopes within ten years to have every wild plant seed in the world. Cold comfort this thoughtful last ditch effort to bring plants into a safe haven to ensure their long term future.. About one third of the world's plant species will likely disappear in next 50 years. The greatest treasure in the all the world are these wild plant seeds .500 years in Shangri-La at -20 degrees C- rainforest seeds don't freeze very well, certain tree seeds don't hang on, best long term candidates are weeds. Our Mighty Vegetarian King tells us " I feel I am opening the Bank of England of the Botanical World, a place where this reserve currency, in this case, life itself, is stored." 19) For those Stateside immune to Royal prerogative, we remind you that "Best Product" at the Seattle HempFest 2000, was feral Oregon hemp fibre submitted by an unidentified Eugene area advocacy group. "Operation Ditchweed" Thanks to all Hemp Report readers who have sent leads on where to find wild hemp. This wild gene pool may be very important for future breeding of far north adaptable varieties. Each wild hemp location is different -- we want them all to learn just how these diverse hemps thrive so well in such adverse conditions.